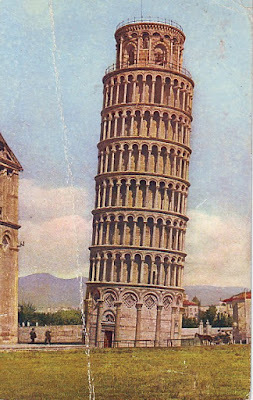 I've lived in Italy since 1994 so it seemed appropriate that I add an Italian vintage postcard to this gallery! This image is of one of the country's most famous landmarks - the leaning tower of Pisa - which is in fact the freestanding bell tower of Pisa cathedral in Tuscany. The tower was built in three stages over a protracted period of about 177 years with work on the first floor beginning in 1173. By the time works had reached the third floor in 1178, however, the tower had already begun to sink! It was officially declared a UNESCO World Heritage Site in 1987. 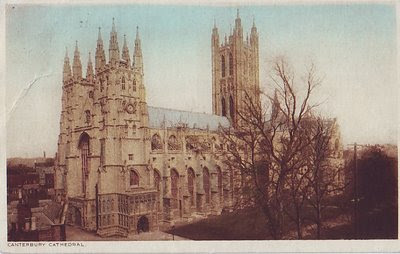 This lovely postcard of Canterbury Cathedral was posted in 1923. This UNESCO World Heritage Site is the church of the head of the Church of England, the Archbishop of Canterbury. It is also famous the world over because of its associations with the martyrdom of Thomas Becket who was murdered in the north-east transept on Tuesday 29 December 1170 by over zealous knights of King Henry II who had taken the king's exasperated cry of Who will rid me of this turbulent priest? rather literally. The pilgrims in Geoffrey Chaucer's The Canterbury Tales are heading for his tomb.